The MOJO® Critter revolutionized the use of decoys in predator calling. It was light weight, portable, affordable, and amazingly effective. 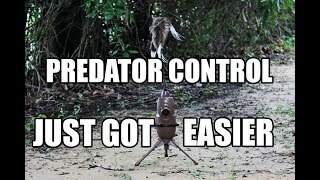 Once a predator sees the action of the spinning flexible top, they lock on and rarely turn loose, causing them to finish, often right up to the decoy, which greatly assists in preventing them from seeing you and busting. It was so successful; it has been often copied, but never duplicated. NOW, the Critter 2 has been improved to be more durable and use friendly. SAME GREAT ACTION, but in a more durable body with built-in tripod, drop-in batter holder, clips to hold both legs and topper when not in use. Includes MOJO®'s standard peg for other mounting options like the MOJO® Critter Extension Pole. Operates for days on 4-AA batteries (not included). If you want to hunt with the best, hunt with the MOJO® Critter 2. Used the Critter 2 for about a dozen hunts. Like detachable tail. Good motion. Quite motor. Legs too short in snow and can't use standard peg extension in frozen ground. Clips to hold legs don't work well in cold weather. Worst part is the on/off button turns on way too easy. Any bump turns it on. After hunts I put unit in bag or vest pocket and get back to truck and hear motor running. Twice got to spots and found batteries dead. Molded guard by button is little to no protection. Over all, good concept, poor execution. More field testing next time. More info on my Critter 2. Used it another 10 times now. Have to be very careful of on/off switch. Did kill one dog as he stopped to look at it. Elastic on all 3 legs are now broken and not long enough to re-tie. Not happy at all with this product. Will see what kind of customer service I get! Holden Smith 1 years ago. And our service techs will get in touch with you about repair or replacement. We look forward to hearing from you and working towards a solution. @z-dog Glad we got you fixed up! Don't hesitate to let us know if you need anything else! I did get very good customer service when I call about the broken legs on my Critter 2. I received a new set of legs in a few days. I have had no issues of elastic breaking at this point, but the elastic on the legs is very tight (Same as the first set.). Hope I don't have the same problem. I've only used it once so far, but I'm pleased that it withstood sitting out in the falling wet snow without a problem. I've never used a decoy while hunting coyotes. This, I'm sure will draw their attention away from me. I wish I could say it worked, but no such luck this time.